ALPOLIC – As architects seek more variety and sustainable building materials, metal wall panels made from recycled aluminum offer a solution. When it comes to green—and versatile—options, ALPOLIC, the world’s leading manufacturer of aluminum and metal composite materials manufactured from up to 50% recycled materials, is leading the way. Produced by Mitsubishi Chemical Composites America, ALPOLIC Materials is helping engineers and architects create better, more beautiful buildings. 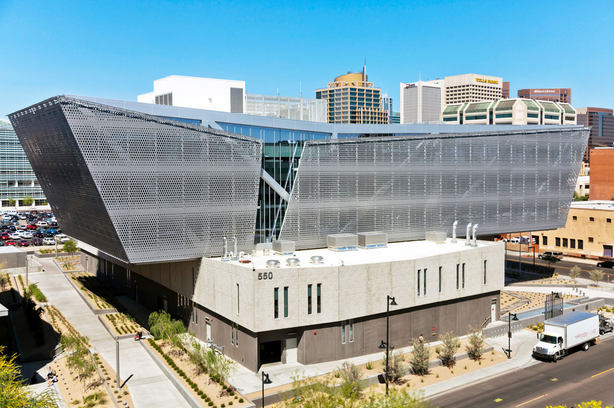 Jim Moses, technical services manager at ALPOLIC, points to the Maricopa County Sherriff’s Office Headquarters in Phoenix, which used a majority of metal composite material with a natural zinc finish, as one key example where an architect had a grand idea and was able to realize it using the product. These are a few reasons to consider ALPOLIC Materials. If you’re looking for a lot of finish looks in a product line that’s easy to work with from a construction point of view, ALPOLIC is an obvious choice, Moses says. ALPOLIC materials are lighter in weight, easier to fabricate into complex forms, and easier to install than traditional materials, while still offering flatness, durability, stability, vibration damping, and ease of maintenance. 2: They have multiple color and finish options. With almost 80 stock colors as well as a wide selection of glosses and finishes like wood, stone, and prismatics, plus the typical micas and metallics, and the ability to specify custom colors, you can match ALPOLIC materials to virtually any color or finish. For instance, Butler Tech Bioscience Center in Ohio made good use of the material’s flexibility and color options by using contrasting colors in ALPOLIC’s metal panels coated in Valspar’s Valflon. ALPOLIC is a lower-cost way to clad what otherwise would be an ordinary building and make it stand out. For instance, auto dealers often use ALPOLIC panels to freshen up their buildings and make them look bright, shiny, and new. “The versatility of the types of buildings you can clad is one of the hallmarks—you don’t have the issues found with plate or more fragile cladding alternatives,” Moses says. ALPOLIC also offers special trim touches and shimmer or effect finishes to accent an entryway or window wall. ALPOLIC keeps its footprint as small as possible, recycling the excess paint as well as the aluminum and core materials. It also publishes a material ingredient report to ensure the materials won’t cause environmental issues. The company has a commitment to lead-free coatings, with a fire-retardant core in the panels that’s good for the environment and human health and wellness. Its recycling program, Encore, reclaims metals and reuses materials from previous projects. 5: Quality control is on point.